By Srinivas Chowdary Sunkara // petrobazaar // 5th February, 2019. 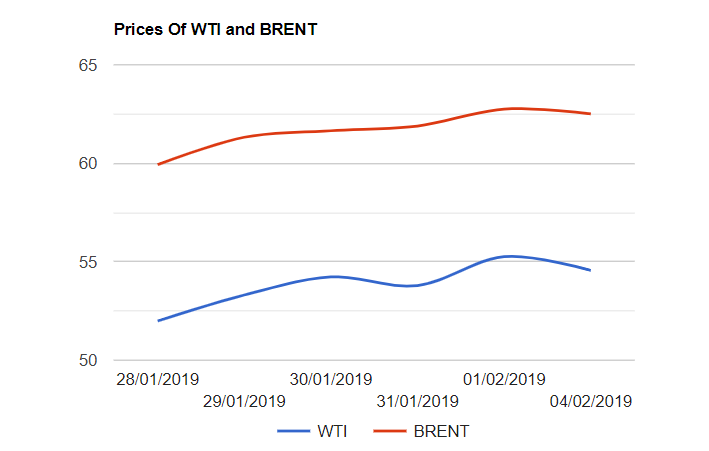 Brent lost 24 cents or 0.38 percent to close at $62.51 and WTI prices dropped by 70 cents or 1.27 percent to settle down at $54.56 a barrel last night. Following the rally on Friday, Propped up by strong job data and falling U.S rig numbers, Market shifted focus on to weak Chinese and U.S economic data which reignited the demand concerns, weighed on oil prices yesterday. Brent prices gained around 15 pct while U.S crude advanced around 17 pct in January. Fundamentals like U.S sanctions on Venezuela's state owned oil firm, PDVSA , Cuts in U.S rig numbers continued to support oil prices. OPEC oil production fell sharply in January, Thanks to strong compliance rate with production cut pact by OPEC + and involuntary declines in Iran, Libya and Venezuela. EU threatening Venezuela with sanctions may be forthcoming to support oil prices. API numbers are due to release today and Asian markets are opened in green today. Good day.